Inbuilt silicone pad provides a professional approach to reducing pain and discomfort by applying fantastic compression and stability. The Inner-Fire Advanced Knee Strap is made from Coolmax® and Airprene® technology that helps to wick away sweat for longer lasting relief and comfort. 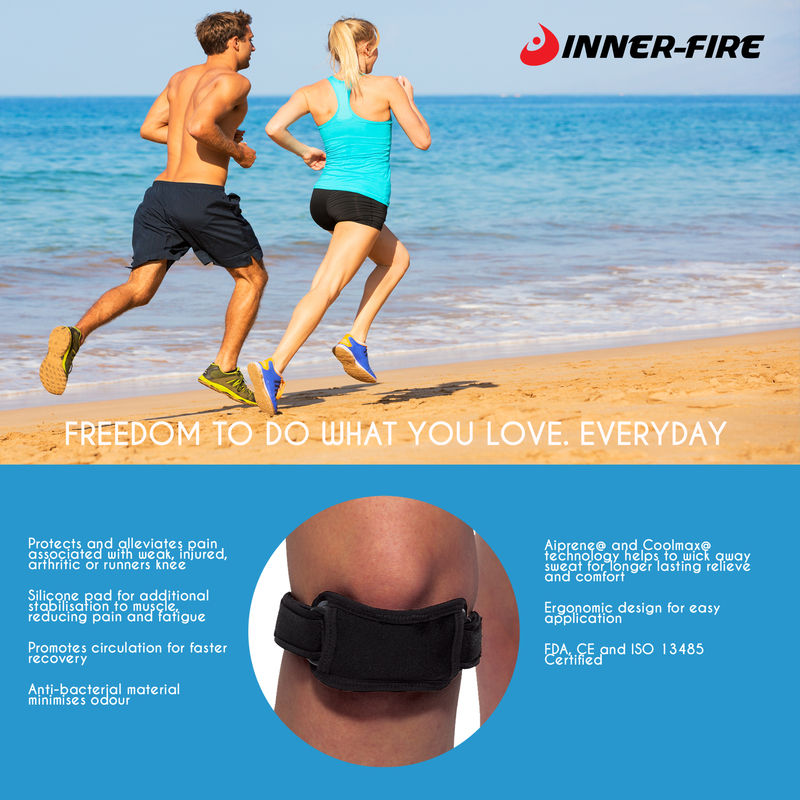 Inner-Fire Advanced Knee Strap is made from high quality materials and technology standards (FDA, CE and ISO 13485 Certified) that provide excellent durability. Simple design allows for easy application that can be fitted in seconds. Its simple yet effective adjustable Velcro design accommodates most knee sizes while providing comfort all day everyday. Got it through the FB promo with freeshipping. Arrived in 2 days to St Peters. Quality I can tell is very good compared to my previous ones. Looking forward to tryinG it on! Helped me run a marathon! This brace saved my knees and helped me run a marathon. I was having knee pain while training and I came upon this through Facebook. I purchased these based on the reviews and I was not disappointed. I never had to use a brace of any sort so I didn't know if it would help but I could immediately feel the difference in my stride because I was no longer feeling the pain. Even after my race, I still wear them when I run or do any workout that will require jumping or pressure on my knees. Definitely worth a try! Recently felt pain on the knee while running and jogging. A friend recommended me try to use this knee support strap. So, I bought these straps and tried it out. Amazingly, I felt the different after the first run, my knee didn't feel pain like I used to, so this things work for me. The reason I choose this brand and model is because of the two adjustable straps, and it feels very comfortable. Had some serious knee pain after running that wouldn't resolve. Used one of these and it helped immediately, resolved the knee pain over a month or so of use. Surprised me! Very comfortable. The best I've tried. Bought these for my wife who does alot of distance running and was having some knee pain. She says she loves them, they give the support that she was looking for in a knee brace for running. And she really likes the padding material that provided additional support. I injured my knee while training too hard for the City2surf a year ago. It is only after 10 minutes or so of running that my knee begins to hurt then it becomes impossible to continue due to the pain. I also felt pain when walking down stairs. I found out first-hand what runners knees felt like which is odd because I’m a reasonably active person. So I was having a conversation with a friend regarding this and they recommended that I try on a patella/knee strap. To be honest, at first, I was sceptical because I have already tried different approaches including stretching, strengthening exercises, Chinese acupuncture and cupping with little result. So imagine the joy I felt when the knee strap actually made a difference! The pain is virtually gone even when running long distances. Now I’m running 3 to 4 times a day and it’s such good feeling to be able to do that again. There is a downside however and that is after I took off the strap, I can still feel some pain so it doesn’t actually make the pain go away only suppresses it. It’s not a permanent fix but for the times I had it on, it really did ease the pain and I was glad I purchased it. I would recommend this product. After a nasty fall a couple of months ago, the broken bones healed but my knee wasn’t getting any better. I’ve tried different knee braces recommended by the Dr and friends. However, they all were very uncomfortable. They would either fall down or feel too tight and I was always adjusting them. After researching my condition and knee symptoms, I realized I had "Jumper's knee". I ended up ordering 3 of these so I could share with friends who complained of the same thing. I've been wearing mine for about a week now when I'm up and about. It's remarkable how much discomfort seems to be relieved. The pain has not completely gone while wearing it, but has decreased by around 75%. Everyday when I get out of bed, my knee hurts less. I wish I hadn't waited so long to discover this wonderful little strap around my knee. It doesn't cut off the circulation in my leg, I don't have to constantly adjust it and sometimes I simply forget I'm wearing it. I am 59 years and counting. Played basketball, softball and did a few runs back in the days. Have settled, gained weight and now started back with walking, left knee was giving me some pain, but after receiving and using this brace, am back in business! I like the design and style of this knee strap/brace. They are very easy to put on and adjust and doesn’t look like I have a debilitating injury. I purchased two, one for each knee. I use them just about daily, and I can feel they are working. I don't expect a miracle, so if that's what you want I don't think you will get it, but if you want relief with support, you should be pleased with these. Recommended. Great for soccer. No movement restrictions. I really like this patella brace. I have an injured knee and I need this to play almost any sport. It's made of very high quality materials, and when it is in place it's not moving anywhere thanks to its silicone padding. It provides a great support and stability, more than I would expect from something this size. I tried it for the first time playing soccer and I was surprised in how comfortable it felt. You won't get any movement limitation, which is great! This Patella Knee strap is awesome. I have tried a lot of different knee braces for my knee and none of them have really helped out a lot but this knee strap has helped me a lot. I would definitely recommend this knee strap to everyone. It is well worth the money and very easy to put on and take off. Helps my knee pain. I ordered two knee sleeves too, and I find these knee straps help relieve my knee pain more than the knee sleeves. I have a meniscus tear the doctor is sending me to physical therapy for in hopes of shifting my weight off the tear to other side of my knee to allow the tear to heal in an effort to circumvent surgery. The other knee is in pain because I had meniscus tear surgery repair done many years ago, and the meniscus is wearing away, causing pain. The only reason I didn't give these a 5 star is because they tend to smell after a while but that could be because I wear mine all day without washing.